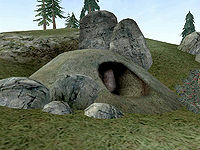 Solvjord is a cave due south of the Tree Stone and north of Fort Frostmoth. It is located close to Brodir Grove on the Isinfier Plains, west of the Iggnir River. Depending on when you perform the related quest, the missionary Mirisa may be found here. The name is most likely a compound word consisting of the two words "sølv" and "jord", which means "silver" and "dirt" in Danish and Norwegian. This page was last modified on 27 January 2014, at 22:49.